Beatty residents had a chance to hear from candidates for local office at an event sponsored by the Beatty Town Advisory Board Sunday, Oct. 5. Although it was billed as a “Candidates Night,” it actually started at 2 in the afternoon. Richard Stephens/Special to the Pahrump Valley Times Assembly District 36 candidates Lesia Romanov and Dennis Hof answer questions from moderator Jerry Adcox. 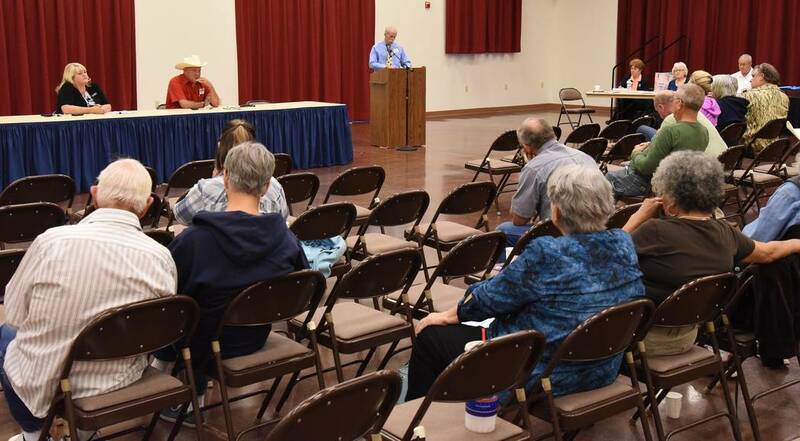 The event was open to candidates for Assembly District 36, sheriff, district attorney, and Nye County treasurer. Not every candidate attended, but many did. Moderator Jerry Adcox read questions to the candidates that had been passed through the committee of the event’s organizers. Questions directly from the audience were not allowed, nor was debate. At tables in the back of the room, residents could visit with candidates and pick up campaign materials. Attendance was sparse, but it gave those who turned out an opportunity to hear the candidates’ views on a range of issues. The organizing committee included Adcox, along with Debbie Baker, LaRene Younghans, and Bob Marchand.